Welcome to Winnikoff Family Organic Farms, where there is a plethora of too small peaches, rosemary, lemons, and apples upon apples! In fact, there are SO many apples, that I've been able to create rosemary-lemon apple-blueberry crumble bars, apple crisp, no-sugar-added apple compote, and now I SOMEHOW still have (more than enough) to recreate the marvelous Alice Waters' apple tart. And though she is a genius in her own right, I couldn't help but make a small adjustment just because, why not? Mix together all the first three ingredients for the dough. (I just clicked my Cuisinart a few times). Add two tablespoons of the butter. Mix until flour mixture is slightly coarse and crumbly. Add the remainder of the butter, and mix until the biggest pieces of butter are about the size of large peas. Dribble in chilled water, one tablespoon at a time, continuously mixing until dough just holds together. If dough seems VERY dry, add a teaspoon(s) of water until it holds together. Remove dough from processor, form in into a ball and then flatten and shape into 4 inch disk on seran wrap. Pop disk in fridge (or freezer) for at least 30 minutes. Preheat oven to 400˚F. Place baking sheet inside to preheat with oven. While the dough is chilling, fill up a large bowl with ice water and squeeze the juice of half a lemon into it. As you slice the apples, place the slices in the bowl to prevent browning. Place snippings and cores aside in a separate bowl. Remove crust from refrigerator (or freezer.) Let it thaw a bit so the dough is malleable. Once dough is soft enough to move, flour a piece of parchment place disk on it and then flour top of disk. Roll the disk out until dough is quite thin and about a 14-inch circle, using flour as needed to prevent the dough from sticking. Lightly grease tart pan and then place dough inside (it's okay that there is extra on the edges.) Place the apples going in ONE DIRECTION in a circular pattern. Start with a bottom layer, and then just start layering the slices on top. These "layers" don't quite matter too much, just try to keep the density uniform. When you get to the top, remember this is what will show, so place carefully. Once apples are all assembled, fold the extra dough hanging off the sides over--the tart will resemble somewhat of a crostata. Liberally brush top of the tart with melted butter (crust and all) and then sprinkle with sugar--use about 2 tbsp for the apples and the remaining 1 tbsp for the crust. Place tart in oven on heated baking sheet. Bake for about 40 minutes, rotating the tart once or twice to ensure even cooking. Remove and let cool for about 15 minutes at least. Place cores and snippings in saucepan with sugar. Add water until the apple pieces are barely floating. Bring pot to a boil then let simmer for 20-25 minutes. Once reduced, strain syrup with a fine mesh-sieve (or cheesecloth) squishing the apple pieces to get all their juices. Brush apples with syrup, (pour if you get impatient like me), and make sure all is evenly coated. My apologies for taking a bit of a hiatus. As my senior year has been coming to a close, I've finally gotten the opportunity to do a bit more baking. And since I am lucky enough to escape the wrath of finals this year, I thought I should support my lovely friends who weren't so lucky with theirs. Let's be real, what better support is there than scones? If I wrote the dictionary, I think scones would be defined as "a baked good, originally from the United Kingdom; a mixture between a muffin and cookie; a synonym for love." I thought I'd give creating my very own recipe a go. I must say, while my lactose-intolerant stomach isn't too thrilled, my tastebuds are. So go ahead: bake a little. Preheat oven to 375˚F. Prepare a baking sheet with parchment. Cut up strawberries into quarters, sixths, or eights (depending on strawberry size.) Place cut strawberries into a bowl and add the other 3 ingredients. Toss with hands until strawberries are evenly coated. Spread out strawberries onto prepared baking sheet. When oven has reached temperature, bake for 20 minutes. If liquid is still not bubbling, increase temperature to 400˚F and bake for 5-10 more minutes. Be careful to ensure the strawberries don't begin to burn. Strawberries should look somewhat dried out, but NOT burned. Remove and let cool. Increase oven temperature to 400˚F. Prepare another baking sheet with parchment. Add in cooled strawberries, trying to leave most of the roasting juice. Gently mix with your hands to ensure all strawberries are coated in the flour mixture. In a separate bowl, combine buttermilk, eggs, and any extra liquid left over from he strawberries. After they're fully combined, add to the strawberry and flour mixture. Mix with hands GENTLY (nobody wants a tough scone), until all ingredients are just combined. If dough seems very wet, add in about another ½ cup flour. Beware: things are about to get messy. Flour prepared baking sheet thoroughly. Reserve another bit of flour to use throughout the process. Place dough on parchment and cut into desired shapes; (I recommend squares, triangles or use biscuit cutters.) I recommend flouring the knife for each cut. Spread scones out evenly on pan. If desired, brush tops with buttermilk and sprinkle with coarse sugar. Place in oven. Bake for 14-20 minutes. Enjoy the balsamic-strawberry, whole-grain goodness. I feel nut-butters are something not often given much thought. Choices at the store tend to range from that jar of natural honey-almond butter upwards of $10 or a slightly less-expensive jar including ingredients such as "corn maltodextrin" and "other natural flavors." So why not just make your own? Almond butter is relatively easy, but aside from a food processor it does require one major component: patience. I've attempted almond butter in the past, only to be left disappointed with almond "meal" or "dust" and desperately adding oil in the hopes of making it emulsify. All I can tell you is that it takes time. Lots and lots of time. And just when you are about to give up hope for the umpteenth time, you will get a nice nut butter. Place almonds into a large frying pan. Set over heat constantly mixing the almonds on the stovetop. Once the almonds start "crackling" and are smelling (for lack of a better word) "nutty" remove from heat. Allow almonds to cool. Assemble food processor. Add almonds and blend for 15 minutes, periodically scraping down the sides every 2-3 minutes. If nuts have not emulsified by 15 minutes, THIS IS COMPLETELY OKAY, mine took about 17 first time around. Once desired consistency has been reached stir in honey, cinnamon and salt. If desired you can do this in the food processor as well, but you will most likely end up having to re-emulsify your butter (another 10-15 in the processor). You now have a homemade delicious slightly sweet + spicy almond butter. The only thing to do now is grab a slice of your favorite bread (homemade or otherwise), lather it up, and enjoy! The holidays are without a doubt my favorite "time" of year. Not necessarily my favorite "season," but these words are not synonyms. Rather, I love how giving and joyful the holiday atmosphere is. Honestly, I find it a tad sad that we have to have a "time" for this, but nevertheless it is lovely. Determining gifts is always a doozy. It's no secret that the best gifts are "gifts from the heart." But I mean really, what does that actually mean. Reflecting, I know some of the best gifts I've received have to do with thought and effort. For me, this means creating some holiday noshes to share, some savoury and some sweet. And let's begin with going a little "nuts." Preheat oven to 325˚F. Place almonds in a bowl with the rosemary. Drizzle in oil and mix with hands. Add salt and mix again thoroughly. Place parchment on a baking sheet. Pour almonds onto sheet, spreading into a single "layer." Place in oven and cook for 15-20 minutes, or until roasted to desired. I know--it's a miracle right? Any who, this break has given me the amazing gift of some free time. OF COURSE, if you're my college counselor or parents, this is for applications. Luckily...... I've managed to sneak in some of my own personal desires (aside from of course writing essays) of art projects, visiting with friends, an abundance of coffee, and baking! I wanted to make some cookies since it's around the holidays, but also just couldn't help but notice the sesame oil peeking out from the pantry. As always, I try to make my food dairy-free to avoid having to ingest yet another Lactaid, but I also wished to make it gluten-free, so a certain someone could eat it without discomfort. And after a little bit of experimenting, I think it worked out quite well. Preheat oven to 375˚F. Whisk first five ingredients in a large bowl. In a separate bowl, beat together all the oils and sugar (I suggest using a KitchenAid mixer if possible). Then add the egg and vanilla extract. Once thoroughly combined, add the flour mixture in additions. When the wet and dry mixtures are fully incorporated add sesame seeds and coconut flakes and mix until evenly distributed within the dough. Prep two baking sheets with parchment paper and grab whatever scooping implement you wish. I suggest using a (very) small ice cream scooper and setting about a two-tablespoon sized amount of dough on the sheet. Flatten out the dough a bit but don't make any thinner than about ⅓ inch (the cookies hold their shape pretty well). If desired, add a little more dough on top to create a "rounder" cookie. Sprinkle with extra sugar if desired. Place sheets in the oven for 8-11 minutes, or until golden. Let cool. These cookies came out even better than I anticipated. They're crumbly, yet crispy and fluffy at the same time. Honestly my mind is kind-of blown. They are definitely not too sweet, and if you like your sweets sweet, I encourage you to add another ¼-½ cups of sugar. I'd expect a bit more from me over this coming week especially with the Thanksgiving festivities almost in action. Until next time, I wish you a delicious day. The last day before getting back into incessant college app revision and work, on too little sleep, so naturally, I need to bake out what I can. I've loved mochi ever since I was little but never even thought about creating it myself until about a year ago. I've always been partial to green tea mochi myself, but I thought why not try something new? And this way, I can enjoy a cup of green tea with my little gems of sweet, coconutty, rice goodness. Oh, and they are also vegan AND gluten-free. Preheat oven to 350 ˚F. In a large metal bowl, combine all the dry ingredients (first four) and mix thoroughly. In the bowl of a standing mixer, combine all wet ingredients (last three). (You can also use a hand-held mixer or just do it by hand.) Add dry ingredients to the wet, with mixer on low-speed, and mix until dry ingredients are fully incorporated. Spread mixture evenly in a greased 9"x13" pan. Cover the top with foil and bake for an hour to hour + 5 minutes. note: It is suggested that you use a plastic knife. Unfortunately, I don't own any, so I just used a regular kitchen knife. The first slice, I oiled the knife and it seemed to help a tad. But really, it is mochi, so it is just going to be sticky. In honor of National Chocolate Milkshake day..... I made biscotti! Makes total sense, right? Well, anyway, it does in my head. I wanted to create another care package, and wanted to make something that would travel well. A nice, crisp biscotti seemed to fit the call wonderfully. Preheat oven to 350 ˚F and prep a baking sheet with parchment. Mix first 5 ingredients (flour, sugar, powder, matcha + salt) in a large bowl until fully combined. In a very large bowl, whisk the eggs and vanilla extract until fully combined, and then add melted butter in a stream, continuously stirring as to not let the eggs cook. Add the flour mixture to the bowl and mix with hands until fully incorporated. Add almonds and mix with hands until combined. Separate dough into two logs, flattening the tops. If needed, flour your space and hands, however mine was quite dry. Brush each log generously with the egg white and sprinkle with the ginger sugar. Chances are, there will be a about 1 tbsp sugar left over. Bake logs for 20-25 minutes. Remove, and once cool enough to handle, slice logs diagonally in pieces about ½ inch wide. Turn cookies to sit on their sides. Decrease heat to 275˚ and place in oven for 18-20 minutes. After time, turn cookies on the opposite side and bake again for 18-20 minutes, or until crisp and dry. If you like them extra crispy, (or accidentally make them a bit too wide whoops! ), I suggest flipping them over one last time and baking for 3-4 minutes. Remove and enjoy with on a nice hot day with a glass of chilled almond milk, or a chilly afternoon joined by a nice correlating cup of matcha. There have been a couple care packages I've been meaning to send, and so, what better a time than to try out some new cookies? I went in search of a biscotti recipe (trying to think of what would keep best) and happened upon these. After getting all the ingredients, and reading the recipe through, I realized these really weren't biscotti at all. But what the hell. Might as well give them a shot right? Prepare a couple baking sheets with parchment, and preheat the oven to 350 ˚F. Mix, (I used my hands, but I'm sure a spoon or whisk would work), the almond flour, sugar, zest, and anise seed until combined in a large bowl. Add egg whites and almond extract and mix until combined. Add 1 cup of the sliced or slivered almonds and mix until combined. Bake cookies for 10-12 minutes (the smaller the cookie the faster they will bake). Gobble down the delicious almond-y goodness. As you can probably tell by now, I am a huge Farmers' Market fan. Yet, it's summer. This leads to the big watermelon conundrum. I could either spend a relatively obscene amount for a delicious melon, or get an organic, just as fresh one for a much better price at my local Whole Foods. At the insane rate in which watermelon gets consumed in my house, I end up opting for the latter. As summer winds down, I'm just trying to squeeze every little bit of fresh wonder out of these warm days. My result was this palate cleanser: watermelon-mint sorbet. If you'd like it as more of a dessert, I would suggest adding a bit of agave or simple syrup. And yes, somehow the color of the sorbet is completely untouched. Purée chunks in food processor, in batches. Combine purée batches into one large bowl. If there are some larger pieces still left over after your "done", purée one more batch with only those pieces. Add chopped mint and vodka and stir to fully incorporate. Put mixture into an ice cream machine and follow according to machine's instructions. Freezing time can vary. You will most likely end up with some extra purée. I have yet to try it, but I believe the mixture would be very delicious in some sort of end-of-summer drink. The vodka is used to keep the sorbet from seizing when frozen. Lemon juice will do the trick as well; I just find vodka to be a bit more productive. rhubarb : "pie plant" : not just "pink celery"
One of the most marvelous tastes of summer is that of the tangy veggie known as rhubarb. Even though it's truly a vegetable, when combined with a little bit of sugar, honey, or agave or maple syrup, and often another fruit, it can create a lovely sweet. Having had rhubarb in combination with other fruits, I wanted to give it a shot on it's own and see how it held up; I was most definitely grateful I did. First, clean the rhubarb stalks and slice into about 1-inch pieces. Add to a heavy bottom sauce pan with the remaining ingredients and mix. Bring mixture to a boil, and once the juices from the rhubarb begin to release, reduce heat to a low boil/simmer. Keep mixture on heat for 25-30 minutes, and as rhubarb breaks down, mix and crush with a wooden spoon. When the mixture looks thoroughly broken down, and quite reduced, turn off the heat. Purée rhubarb mixture (I used a food processor), then jar and enjoy! The plus side (if possible) of living in the drought-plagued region of southern California is that we actually get these incredibly warm days (for Santa Barbara) that make it truly feel like summer. Summer makes me think of two wonderful things: fresh produce and iced treats. Being lactose intolerant, sorbet has always been a friend of mine. As I walked through the farmers market, I happened across a table full of organic herbs. Never have I known that there could be so many different types of basil: lemon basil, persian basil, opal basil, sweet basil, thai basil and so many more. I couldn't limit myself to just one bunch and thought I'd give the persian and lemon basil a try. I had a marvelous-looking (and smelling) organic cantaloupe from Whole Foods. The match was perfect. The result? A scrumptious, fresh, light (and insanely easy) sorbet. Cut cantaloupe in half. Scoop out all the flesh (I used a grapefruit spoon) into a food processor. Slice the basil into strips. Add to food processor. Blend until smooth. Pour into an ice cream maker and follow its directions. Serve immediately or place in freezer to harden up. Nothing makes me quite as happy as some sushi, and better yet, HOMEMADE sushi. I was introduced to this art (which can be easier than expected) by my wonderful friend Ellis around New Year's. After getting some beautiful produce from the farmer's market and perfect tuna from Whole Foods, I felt as if my own sushi adventure just had to occur. Pour rice in small bowl. Run cool water over and swish with hands. Drain water from rice. Repeat this step until the drained water becomes clear. Place rinsed rice in a small pot with the water and salt. Bring to a boil, and then reduce to a simmer. Cook like this for 30-40 minutes. Once finished fluff with a fork. 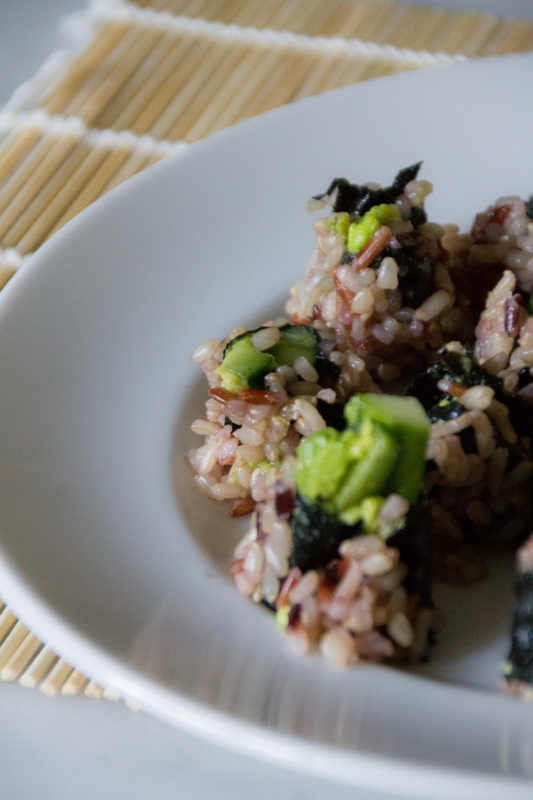 Let rice cool for about five minutes. While rice is cooling mix together the seasoning mixture. Once both components are ready, spoon seasoning into rice while mixing. I used about four spoonfuls, but you can decide based on taste and preference. Prepare your fillings by slicing them into long pieces about ¼-½ inch thick (or in other words julienne them). I would love to go into how rolling sushi works, yet I'm still in the very early learning process myself. I hope to share another post in the future once I have some more experience under my belt. All I will say, is that I found wrapping with the nori on the outside much more successful. 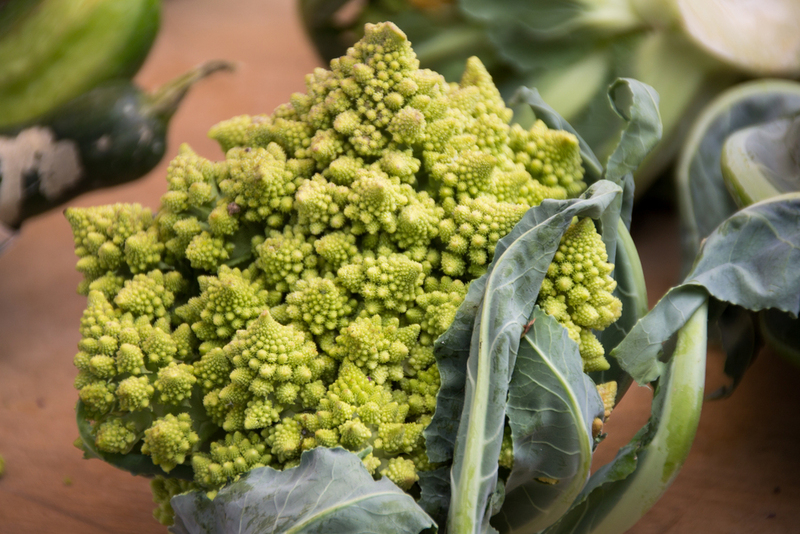 I find there's no better way to spend a Saturday morning in Santa Barbara than perusing through all the fresh groceries and goods offered at the downtown farmers market, especially due to all the wonderful summer crops that are now available. I mean really where else (aside from other farmer's markets..) can you enjoy live music, brilliant fresh-picked strawberries, and honey sticks for the little ones all at the same time? Not to mention being surrounded by the sensuous aromas of roses and (my personal favorite) tuberose. There was absolutely beautiful looking basil. Oh and the kale, the lovely kale. I couldn't help myself. And with these two I was inspired to create another original recipe. One of my favorite sauces is pesto. It can essentially go on anything, sandwiches, pasta, proteins, salads... the possibilities are endless. Add first 3 ingredients to a food processor and blend. First I got out two pieces of ezekiel bread, and lightly toasted it. I put about 1 tbsp of pesto on each piece. Took my smoked turkey meat and laid it on the bread. I sliced up some stunning heirloom tomato from the farmers market, and situated those atop the turkey. And last, but not least, did a slight sprinkling of crushed red pepper for a bit of heat. I sliced my tartines diagonally and served with some green tea and cucumbers + celery. Recently, I've been on a hummus craze. Don't ask me why, because I honestly have no clue why I've fallen in love with this mediterranean dip. Regardless, after coming across this recipe, and with two cans of garbanzo beans in the pantry, I just couldn't refuse. Heat olive oil in small pan. Add garlic and let cook for about 30 seconds. Then add curry powder + cumin. Mix until combined for about 30 seconds. Then remove from flame. Place garbanzo beans in food processor followed by remaining ingredients. Process until smooth. I was lucky enough to have some beautiful carrots from yesterday's farmer's market. Enjoy as a dip for fresh veggies + whole wheat pita chips (I just cut up a pita) or as a spread on flatbread or a sandwich, or really anything else you can think of! Peel apples and then chop into ¼-1 in pieces, depending on desired consistency of crumble. Squeeze ½ lemon and then add juice to apple pieces. Sprinkle on cardamom + stevia. Mix with your hands until combined. Separate the apple mixture evenly in 8 ramekins. Add oats into a bowl. Then add the stevia and chopped rosemary. Mix with hands until thoroughly combined. Add olive oil in stream and mix until evenly spread out among the mixture. Sprinkle crumble evenly across ramekins. Place ramekins in 350˚F oven. Bake for 25-35 minutes, or until apples are cooked and topping gets a little toasted. Serve warm, with or without ice cream or whipped cream. I have known my brother was going to try to make it down here this weekend. To my knowledge, he was supposed to arrive around 10 o'clock this evening. Knowing he was coming, I thought what better way to welcome him than some blueberry treats? I was planning on making them today, but due to my mother's insistent urging, I got down to it last night. I decided it would be nice to create them low-carb, so my father could enjoy them as well. And just around 10:30, as I pulled the scones out of the oven, my brother came waltzing through the front door, weary from a long drive, and unfortunately the sniffles, grateful for a cup hot tea and a warm scone. Combine almond flour with lemon zest. Add baking soda and stevia and mix until fully dispersed. If needed, heat the coconut oil until liquid, and then combine it with the almond flour mixture. Add eggs. Mix with fingers until fully combined, being careful of equally spreading egg-whites and yolks. Add in blueberries. Mix lightly, but still make sure the berries are commingled. Spread the dough out on parchment paper about ¾-1 inch thick, being wary of (not smushing) the berries. Cut circles. Repeat this process until all dough is used. Spread scones out on baking sheet with parchment. Put in oven for 21-24 minutes. Scones should be bubbling and looking toasty by then. If desired, raise the temperature to about 340˚F for a minute to brown near the end of the baking process. My dad recently has been trying to lay-off the carbs due to our family's history with diabetes. This can be quite difficult because of his major sweet-tooth. I felt it'd be best to first endeavor upon creating a low-carb jam that would be just as delicious on his morning toast. 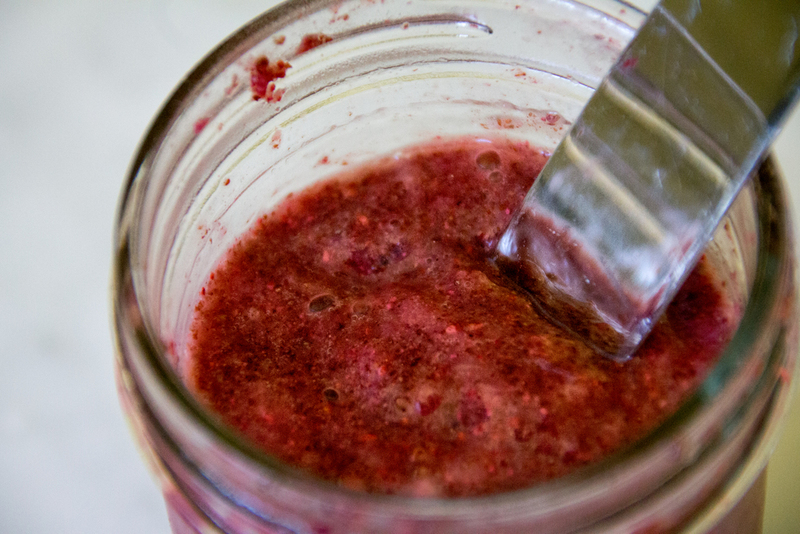 This jam is raw, has no-sugar-added, and is only three ingredients. That's right THREE. The simplicity is wonderfully astounding. Note: this is NOT your traditional jam, but still tastes lovely! The chia adds a bit of a nutty tone. Take bag of strawberries out from the freezer and set on the counter. Add entire bag of strawberries to a food processor along with the ground seeds. Add a few drops of liquid stevia. Pulse together. You can continue pulsing until it's almost pureed, or as I prefer, keep it chunkier with larger bits of strawberry. If you puree completely, the spread will be more of a jelly than jam. If you're having a really hard time with the mixture, you can add a teensy bit of water. Once you've reached your desired consistency, taste spread, and add additional drops of stevia to your liking. Empty spread into jars, and place in the fridge, so the chia congeals. And voila! You now have a delicious, no-sugar-added, low-carb, 100% natural strawberry jam. Today's a huge day of celebration in many people's lives: 4/20... Easter... and it also happens to be the 6th day of passover. And, of course, on this day of days, what more is there for a ginger-haired, jewish girl to do than make "matzo crack"? "Matzo crack" aka matzo toffee is a marvelous creation I happened upon a couple years back. I always hear the question, "What ON EARTH can I make for passover aside from macaroons and flour-less chocolate cake?" The baker of a kosher to passover household picks his or her brains to find something just a little bit different. How did we know it was right underneath our noses the whole time? I will warn you, this treat is definitely a TREAT. It lies on the rule that my beloved grandmother always used to say, "If you put enough sugar and butter on a cotton ball, it'll taste good." 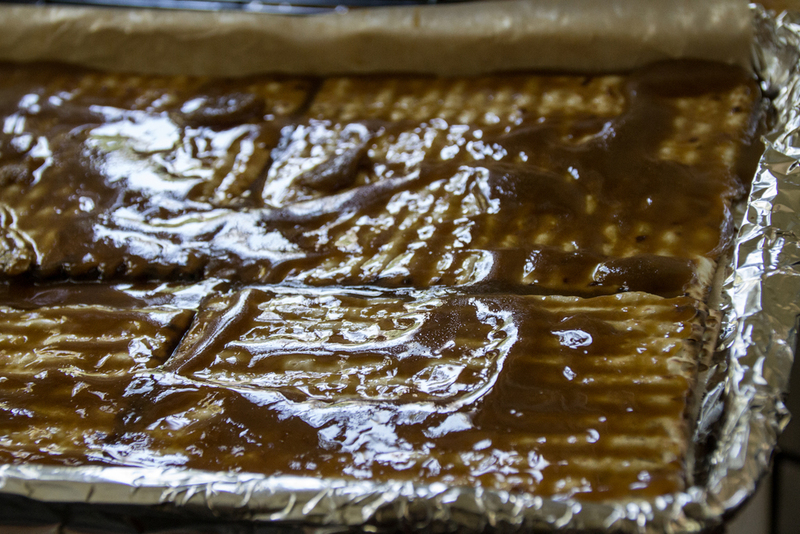 Line 2 rimmed baking sheets with foil; make sure the foil goes up and over the edges. Cover each of the foil-lined sheets with a sheet of parchment paper. Line the bottom of each sheet with matzoh, breaking extra pieces as necessary to fill in any spaces. In a 3-4 quart heavy duty saucepan, melt the butter and brown sugar together, and cook over medium heat, stirring, until the butter is melted and the mixture is beginning to boil. Boil for 3 minutes, stirring constantly. The mixture will look as if it's fluffing up a bit. THIS IS COMPLETELY NORMAL. Remove from heat, add the salt and vanilla, and pour over matzoh, spreading with a heatproof spatula. Put the pan in the oven and reduce the heat to 350˚ F. Bake for 12-15 minutes--my top pan took less time than the bottom (even though it was on convection.) As it bakes, it will bubble up but make sure it’s not burning every once in a while. If it is in spots, remove from oven and reduce the heat to 325˚ F, then put the pan back in. Remove from oven and immediately cover with chocolate chips. Each sheet needs about 1 cup (I was generous and did heaping cups.) Let stand 5 minutes, then spread with a spatula. Sprinkle with desired toppings. Mine included: almond, coconut, almond-coconut, cardamom, and fleur de sel.